Rosette leaves 4–6, ovate to oblong, 1–3 cm long, 6–15 mm wide, margins entire or wavy; petiolate. Scape to 25 cm high, very slender. 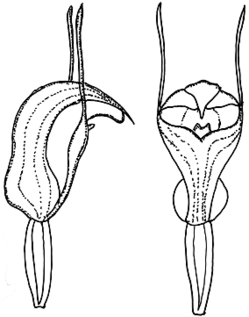 Flower c. 2 cm long, erect, white and dark green with brown suffusions in the galea and sinus. Apex of galea slightly decurved. Lateral sepals tightly embracing the galea; sinus flat when viewed from the front, shallowly mounded when viewed from the side; free points filiform to clavate, c. 20 mm long, erect. Petals broad. Labellum oblong, 6–8 mm long, c. 2 mm wide, dark brown, apex deeply notched, apex just visible through the sinus in the set position. Distribution and occurrence: Grows in moist areas of sclerophyll forest and coastal scrub; south from Mudgee. Hybridises sporadically with P. decurva.